As Rosh Hashana approaches, Israel Railways finds itself flush with money. Just two years ago, Israel Railways was near bankruptcy, but as Rosh Hashana approaches, the organization finds itself in the black – nearly NIS 1.5 billion richer than it was a year ago, officials said Sunday. 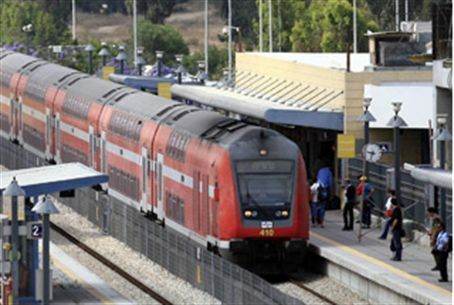 The turnaround is the result of a new commercial agreement Israel Railways signed with the government and private companies earlier this year, in which companies will develop the space at train stations in many parts of the country into commercial malls and office space. That deal is expected to increase the Railway's income by billions over the coming years. Among the cities where the commercial spaces will be developed in the coming years are Ben Gurion Airport, Beersheva, Haifa, Holon, Petach Tikvah and Rosh Haayin, Bat Yam, Netanya, and Jerusalem's Binyanei Hau'ma, where a station is to be built. The model for the stations will be Tel Aviv's Hashalom station, which is attached to the Azrieli Mall. In addition to that deal, Israel Railways experienced a sharp increase in the number of passengers and the amount of cargo it carried this year, officials said, adding that they expected that the trends will continue. By the end of the year, the officials added, they expect the company's revenues to be at least triple what they were in 2011.